Thanks for the replies. Didn't notice on my 2009 but much different technically on these new ones. I noticed quite a bit of black from the weep hole of the muffler and thought the engine may be running rich. Mentioned it when it was at the dealership for other issues. He said the tech looked at another truck on the lift and it was the same as mine. Asked if any codes were present and he said no. Makes me wonder if they checked. Stock muffler. Smokes for a couple seconds, 3 or 4 puffs. Cold start after sitting one day or 5. Been 15 to 25 degrees. Will check again middle of week when it gets to mid 30s. I have noticed black smoke from the exhaust when I use the remote start on cold start up. Anyone else seen this? AND...Air Lift 5000 bags and CalTrend seat covers. Some of these 1/2 ton trucks buck and porpoise when going over dips in the road. I went with Rancho 9000 on my '09 truck. I ran them at the 3-4 position for street driving and dialed up to 8-9 when towing my 25 ft travel trailer. The Bilstien 4600 is a good shock as well but never did heavy hauling when I had them on my '97. with them. Son in law has a 2016 with same drive train. He has the trans issue but not the shake or vibration. The $289 my dealer charges is a bargain compared to that! If you have the time, doing it yourself is the way to go. Any issues with being pulled over for your window tint? I am a fellow Michigander and wondered. Beautiful truck BTW! I was wondering the same thing. 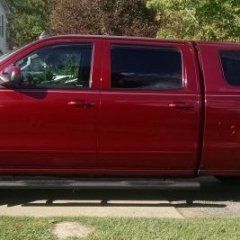 Did your truck throw a code for them to determine the injectors or plug was bad? I mentioned the same issue the way mine was running and pointed out the black residue around the muffler weep hole. Thought one or more cylinders may not be firing correctly. I was told the new trucks show the black on the muffler and my truck didn't throw a code for the tech to look into. Like the brownestone. Wasn't available for 2016 model. Numerous trips for my truck for the vibration/shake. 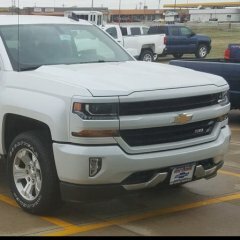 2016 LT Z71 with 5448 miles. My drop down armrest/console would shake over an inch side to side between 70 and 75 at times. 1st trip ... road force balance, then a run with the pico scope. Readings were 27, 4, 48 and 8. Replaced 2 tires and one rear shock that had a leak. The arm rest shake was gone but a slight vibration in the steering wheel was present. Drove it 1000 miles and no better. 2nd trip .... run with pico scope showed right front out of balance. Road forced tire. Same feel in steering wheel up to 75 and then a bad vibration. 3rd trip ... Dealer contacted GM and was told to replace steering bushings. Was told GM came up with a liquid filled bushing to help with the problem. It took care of the vibration at 75 mph but after 600 miles, slight feel in steering wheel persists. 4th trip ... took a drive with shop manager and another guy that travels to the multiple locations of this dealer and 'trouble shoots'. He felt it and used the word 'pecking' to describe it. 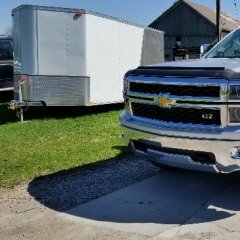 Both admitted GM has a problem and they don't have a fix for it. Took a cue from dmetz82 and took a half full bottle of water with me. The shop manager in the back set zeroed in on it but of course nothing severe showed on the road. They decided to run the pico scope again, attached to seat frame and steering column to get a reading and contact GM for a recommendation if needed. Shop manager called and said the truck was in spec so nothing else they could do. Asked what 'spec' is, and was told 15 and was provided copies of the readings. SO, that is where I'm at. On and off slight vibration mostly at highway speed. Sometimes I think I feel it at slower speeds but the shocks on the Z71 transmit everything little thing on the road. I am surprised service didn't bring that up as a contributing factor for the feeling. How bad is the vibration/shake in your trucks and what are they doing? Mine went in today for the third time and wonder if I am trying to fix something that isn't that bad considering the new frames and body mounts on these trucks.